There was a time when being a member of Lazer Sword was a lot more convenient. Back in 2006, Antaeus Roy (a.k.a. Lando Kal) and Bryant Rutledge (a.k.a. Low Limit) were a couple of San Francisco beatheads who lived together, worked at XLR8R, and bonded over a shared love of underground hip-hop and a desire to experiment with electronic sounds. Working on a Lazer Sword track literally meant walking down the hall, while playing a show was as simple as packing up some equipment and hopping in a taxi. Six years later, things have changed—a lot. In 2012, the seasoned artists now find themselves living on separate continents, as Roy now calls Berlin home while Rutledge has settled in Los Angeles. Making music requires online collaboration and the accommodation of wildly different time zones, while touring means that one of the guys is hopping on a plane and crossing an ocean. In the aftermath of the duo's 2010 debut full-length, ‘Lazer Sword’, it would have been easy for Roy and Rutledge to pack it in and simply focus on their solo careers—in case you missed it, Roy spent much of 2011 dropping singles for the likes of Rush Hour and Hotflush. 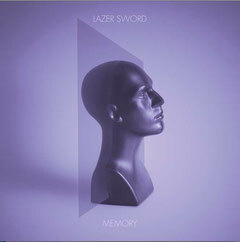 Instead, they've soldiered on, teamed up with Modeselektor's Monkeytown imprint, and put together ‘Memory’, an accomplished 11-track effort that is without a doubt the best thing Lazer Sword has ever done. ‘Memory’ may not be a complete departure from Lazer Sword's earlier work, but those looking for the slapping hip-hop beats and crunked-up vibes that defined the group's past releases may be surprised to find that Roy and Rutledge have seriously trimmed the fat while simultaneously expanding their sonic palette. This is a sleeker, sexier version of Lazer Sword, one that take cues from ‘80s electro, Detroit techno, and various brands of UK futurism. Yes, there is still plenty of low end, but the duo's thick bass tones now serve as a jumping off point rather than a tool to bash you over the head. Some tunes on ‘Memory’ - namely the woozily psychedelic album opener ‘Sky Burial’ and the hauntingly intense synth workout ‘Out The Door’ - don't have any beats at all. Composing ‘Memory’ on two different continents wasn't easy, but its songs quickly make it clear that it was absolutely worth the effort.